Retracing the Road to Justice! 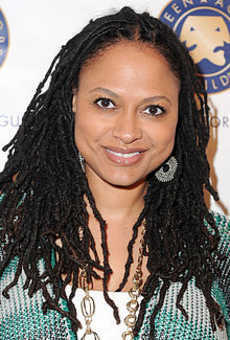 Ava DuVernay is a writer, producer, director and distributor of independent film. Winner of the Best Director Award at the 2012 Sundance Film Festival, Ava was honored with the 2013 John Cassavetes Independent Spirit Award and the Tribeca Film Institute 2013 Affinity Award for her second feature film, Middle of Nowhere. She made her directorial debut with the critically-acclaimed 2008 hip hop documentary, This is The Life. A couple years later, she wrote, produced and directed her first narrative feature, I Will Follow, starring Salli Richardson-Whitfield. Prior to directing, Ava founded DVA Media + Marketing in 1999, and worked as a film publicist for over a dozen years. Her award-winning firm provided strategy and execution for more than 120 film and television campaigns for such industry icons as Steven Spielberg, Clint Eastwood and Michael Mann. The UCLA grad is the founder of AFFRM, the African-American Film Festival Releasing Movement. And she is a member of the Academy of Motion Picture Arts and Sciences, as well as the Academy of Television Arts & Sciences, as well as a board member of both Film Independent and the Sundance Institute. Here, she talks about her new film, Selma, which has been nominated for four Golden Globes, including Best Director. Ava DuVernay: It sure has been awhile, Kam. How are you? KW: I’m great. How about you? Congrats on the Golden Globe nominations, and with the Oscars just over the horizon! AD: I don’t know about that, but it’s been a nice ride so far. KW: I was surprised to see you in Life Itself, the documentary about Roger Ebert, and to learn that an encouraging encounter with him as an adolescent had been such a big influence on your life. AD: He was such a champion of underrepresented filmmakers. He was a very big deal to me. It shows the power of critics. People who write about film, like you, can really affect the confidence of a young filmmaker. He did that for me, so it was such a pleasure to have an opportunity to talk about Roger in the movie. KW: Editor/Legist Patricia Turnier asks: Why was it important for you to bring this story about Selma to the big screen? AD: Because there’s never been a film with Dr. Martin Luther King, Jr. at the center released in theaters. Ever! One does not exist. You’ve only seen tele-films and stage plays about him. Yet, we have big screens biopics about all kinds of people. So, I think it’s only right that there be a full-length feature about Dr. King. I don’t think there could be enough of them, but there should be at least one. So, here it is! KW: Patricia also says: The contributions of many black women to the movement, including Coretta Scott King, haven’t been credited enough. Will the audience learn more about this aspect of history in your picture? In other words, did you bring your perspective as a black female to directing Selma? AD: Yes, Patricia, it was vital to me to include woman characters, and Coretta Scott King [played by Carmen Ejogo] is a prominent one. There’s a full arc where she’s painted, and you get to see behind the veil of her quiet dignity. Another character is Amelia Boynton [played by Lorraine Toussaint], a freedom-fighter who’s still alive and 104 years-old. She’s the woman who invited Dr. King to Selma. Oprah Winfrey plays Annie Lee Cooper, a woman who tried to register to vote five times, but was rejected and humiliated every time, and had a very infamous tussle with the local sheriff in Selma that landed on President Johnson’s desk through the newspaper accounts. Richie Jean Jackson [played by Niecy Nash] and Diane Nash [played by Tessa Thompson] are also in the film. There are a lot of sisters there who contributed to the fabric of the Civil Rights Movement. AD: Yes, the film will be subtitled in some French and Spanish-speaking countries around the world, but I don’t know whether it will be subtitled for the deaf. KW: Environmental activist Grace Sinden says: Congratulations on the Golden Globes nomination for directing Selma. I cannot wait to see it. We know that it is difficult for women to move up in many fields but this issue has recently received much focus, especially in terms of Hollywood directors. What advice do you have for women trying to break the glass ceiling? Can you share your thoughts on this issue? Was it any more difficult for you personally? AD: Ignore the glass ceiling and do your work. If you’re focusing on the glass ceiling, focusing on what you don’t have, focusing on the limitations, then you will be limited. My way was to work, make my short, make my documentary, make my small films, use my own money, raise money myself, and stay shooting and focused on each project. KW: Editor Lisa Loving says there have been thousands of people marching in cities all across the country since the Missouri police officer who killed Michael Brown was not charged in his death. In our town, Portland, we see a whole new generation of community leaders stepping forward, right now. As you made this film did you have any idea it would be released at a time in history when thousands and thousands of young black people would again be marching in the streets for civil rights? AD: I had no idea. It’s very poignant and it moves me beyond words that this film that we’ve made, that this piece of art would be released in such a robust way during this cultural moment rife with energy for change, with people taking to the streets, the power of the people being heard, and their voices being amplified. It’s an honor to have something that speaks to that right now. It certainly wasn’t anything that we knew was going to happen. But I find it thrilling that people are standing up, and I’m hopeful that it will really move the needle this time around. And it’s a little eerie that some of the events in our film are so similar to some of the things you’re actually seeing on cable news today. KW: Lisa also says: I feel that many people “people of all kinds” really do not know what Dr. King did in leading street protests against racist laws even as the FBI, at the highest levels, was breaking privacy laws and even laws of basic human decency to stop him. Do you think learning that about the FBI might surprise people? AD: If you don’t know your history, I think you’ll be surprised to learn it. But it’s very prominent in the public records that there had been this counterintelligence program called COINTELPRO, for short that during the Fifties and Sixties placed leaders of progressive movements in the United States under surveillance. It was created by FBI Director J. Edgar Hoover, and was signed off on by every president in office during those decades. It’s disturbing, it certainly served to dismantle a lot of the progressive movements that existed back then. If you don’t know about it, it’s in the film, and you can Google it and learn more about it. KW: Sangeetha Subramanian says: There are so many lessons to take away from this film and story. Is there one lesson you would like to hear discussed more that may not be getting enough attention? AD: No, I think the film is getting plenty of attention right now. I’m just excited about January 9th when the film will be opening everywhere, and people in the real heart of the country will be able to see it. That’s the day I’m really hopeful about. That’s the day I’ll be on Twitter wanting to listen to what people have to say about the picture, good or bad, as they come out of the theater. KW: Cinema Professor Mia Mask asks: Will you come to Vassar? We’d like you to be a guest of the film department as a visiting artist. We’ve asked you in the past, but your shooting schedule prevented it. AD: Thanks for the invite, Mia. You’d have to put the request in to the office. But I’m pretty booked up right now. AD: Not at all, I just wanted to cast the best actor for the job and, without a doubt, David Oyelowo and Carmen Ejogo are transformative in these roles. And I knew that they would be. David was the first black man to play a King of England on the stage of the Royal Shakespeare Theater. His chops, his acting abilities are exceptional. He gave all of himself to the part, so I hope people will come check it out. KW: Children’s book author Irene Smalls asks: How will you judge the success of Selma, and what movie would you like to make next, if you could do anything you wanted? AD: I will judge the success, not on any awards or on the box-office, but on how people feel and what they say after seeing it. That’s what really matters to me. The film has something to say, and in a very specific way, about freedom and dignity in this country, and about some of the great leaders who worked hard and lost their lives in the pursuit of justice. KW: Well, I loved the film, Ava, and all the best during awards season. AD: Thank you, Kam. I’m so glad I got to talk to you, and I look forward to talking to you again.